Each summer the Royal Society, the UK's independent scientific academy, hosts a showcase of the country's leading scientific research. The 2006 exhibition includes a 3D movie produced by Planetary Visions showing a simulated flight over the surface of Mars. The movie is projected for viewing through polarised spectacles to achieve a stunning stereoscopic 3D effect. The computer-generated movie is part of an exhibit, Rough Guide to Mars, which describes the latest planetary science research at the Open University, Imperial College and University College London (UCL), including the discovery of a frozen sea and evidence of flowing glaciers. 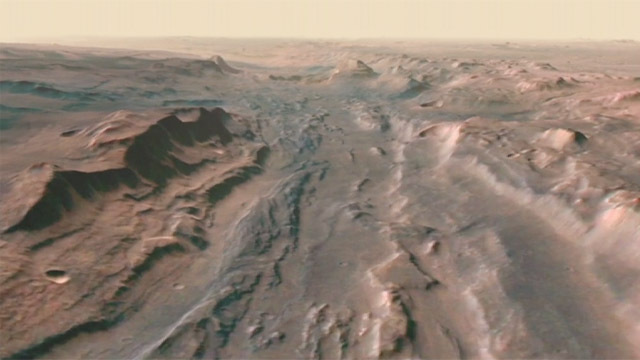 The height map for the 3D movie was derived from images from the High Resolution Stereo Camera on ESA's Mars Express spacecraft using computer vision techniques developed at UCL. Further information can be found at the Life on Mars website. The Summer Science Exhibition was open to the public at the Royal Society in central London from 3rd to 6th July 2006. The Rough Guide to Mars was one of 13 exhibits selected to appear at the Buckingham Palace Science Day on 24th October 2006, part of the Queen's 80th birthday celebrations. This animation was also shown by the BBC in the February 2007 edition of The Sky at Night.